Designed for use with a ZonePlayer multi-room system, the WD100 iPod/iPhone dock sends music wirelessly around the house. There's not much of note here, but existing Sonos users can snap up the cheap-as-chips $119 dock from next month. SANTA BARBARA, CA - September 23, 2010 - Sonos, the leading developer of wireless multi-room music systems for the home, today introduced the Sonos Wireless Dock (WD100), an accessory to the award-winning Sonos Multi-Room Music System. 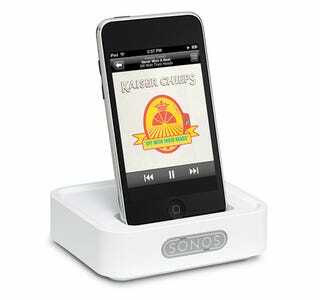 With the Sonos Wireless Dock you can now play all of the music from an iPod or iPhone in every room of the house. The Sonos Wireless Dock will be available for $119 beginning by the end of October. "The Sonos Wireless Dock is the perfect accessory for our music loving customers who own an iPod or iPhone and want to enjoy the music stored on them in any or every room of the home," said Phil Abram, President, Sonos, Inc. "This new dock reinforces our mission to provide our customers with access to all of the music on the planet, including everything available on an iPod and iPhone in the home." The Sonos Wireless Dock accesses all of the music stored or playing on an iPhone or iPod and sends it wirelessly to Sonos ZonePlayers all throughout your home – before converting the music to analog – guaranteeing the best possible audio quality. The Sonos Wireless Dock is compatible with the following devices: iPod touch (1st, 2nd, and 3rd generation), iPod classic, iPod nano (3rd, 4th, and 5th generation), iPhone 4, iPhone 3GS, iPhone 3G and iPhone, and has been certified by the developer to meet Apple performance standards. For more information about Sonos or to locate an authorized Sonos dealer in your area, please visit www.sonos.com.